What is hope? Upcoming Events You Won't Want To Miss! What is hope and how do we get hope? Can you muster it up? Can you will it? Where does it come from? I've been searching out the answer to these questions for some time now. Most of you know that I have several different health issues. I've noticed that my physical pain seems to have some type of emotional hold over me. What I mean by that is, when the pain is relentless for some time or my energy levels are limited, I can easily move into feelings of hopelessness and depression. I used to be able to tolerate high levels of pain. I could work through anything. Often people asked me how I continue to do what I do? And the answer to that is I don't know. I remember my mom used to take me to healing masses at her church. I wasn't a believer then and I didn't really understand what was going on in those services. I got prayed for many times there but didn't get relief. Pain is what led me to the Lord, however. I had a friend who was witnessing to me for years through her pain. And it was her hope in Jesus that helped me realize my need for Him. It's been 10 years since I invited Jesus into my heart. In these past 10 years, I cannot tell you how many faithful prayer warriors have been praying for my healing. I was very touched by one person in particular who said that she would pray for me every day until the Lord healed me. That was several years ago. Today, the Lord has put people in my path who encourage me and help keep me moving forward.. but when I focus on the why's or why nots - why am I not healed God, why not today Lord, I often head down the road of hopelessness. I don't want to go there but how do I get unstuck? God's grace has led me down this path to learn what hope is and how we can get it? When I pray, I hear wait and trust. And as I wait, He continues to show me little nuggets in His Word. He showed me that waiting on Him means focusing my attention on Him in hopeful anticipation of what He will do. 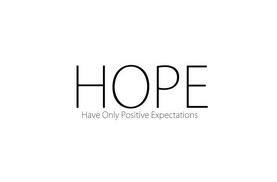 I looked up the word hopeful in the dictionary and here are a few meanings that jumped out at me.... feeling of optimism about a future event, promising, feeling events will turn out good and to trust. I don't know how to muster "good feelings". Do you? In 1 Corinthians 13:13 it talks about faith, hope and love. The notes the commentary wrote in my bible clearly spoke to me especially about hope. Hope is the attitude and focus we have! Faith is based on knowledge of who God is. Knowing God is foundational - and getting to know someone takes time. As I've been spending time in His Word, He's been weaving truth into my heart. God is not a genie in a bottle, where we can wish and wish and get what we wish for? He delights in us wanting to know Him and spend time with Him. I have to admit I often have found myself asking and asking or wishing and wishing instead of just delighting in who He is. The word faith in the Hebrew bible is replaced by the word trust. My faith is based on trusting Jesus! Trusting Him is foundational for my healing. I have to trust His timing. I have to trust that He is working all things for good in my life. I have to trust that His grace is sufficient. And I have to trust that He will heal me. It's ok that I continue to ask for my healing but getting to know Him more and more is most important. Nothing is hopeless if you have faith (or trust in God) Job 1:1 Hope comes from really knowing God! Maybe your situation is different than mine. Maybe it's not a change in health you're hoping for....maybe it's a job or finances, a healthy marriage or even the right spouse. There are many things going on in the world that can steal our hope but if we have our foundations in Christ, His Word and our hope is in Him alone, we can overcome. Faith + Hope = Love. Love conquers all! PS 33:20-22 - We put our hope in the Lord. He is our help and our shield. In Him our hearts rejoice, for we trust in His holy name. Let your unfailing love surround us, Lord, for our HOPE is in you alone! Lord, thank You for Your Word. Thank You Lord that we can put our hope in You. For Your Word holds true and everything You do we can trust. Lord help us to know You better. Help us to keep our eyes fixed on you and not on the circumstances swirling around us. Help us to love You more than anything else. You alone are worthy. In Jesus name... Amen! EVENTS COMING UP VERY SOON! MONUMENTAL reveals the story of the unlikely men and women who risked all for liberty, including the struggles of the Pilgrims, and shares stories of faith that helped shape education, government and civic life in the United States. This special in-theater event will also include live performances from popular Christian music artists, as well as exclusive interviews with media, faith and political figures who will share simple and practical ways to keep America's ideals alive, beginning at home. 3/31/12 - 7pm - An Evening of Worship & the Word! - at the View 13500 Byars Rd, Grandview, MO 64030 - all are welcome, event is free. Marlon & Quantrel Brown will be hosting. Bob Sorge will be at our home 4/4 - we have just a few seats left. If you are interested, please email me. Joni Ames will be available to speak and minister in your church or homes 5/7 - 5/20. If you are interested in scheduling her, please email me as I am helping coordinate her meetiings. 5/5/12 Ken and I will be ordained into full time ministry. Peru update - There really isn't anything new to report. We still feel that God is leading us back to Peru this summer but all the logistics are a complete mystery to us. We don't understand why all seems quiet but are believing God will work things out in His timing and in His way. I can tell you that my heart is slowly changing towards moving to Peru. I've found myself wondering about what moving there long term would look like. If you feel led, please keep us covered in prayer. We so need God to intervene and speak to us further. We had a great time ministering at a home group this past Friday and Ken brought a great teaching at Raytown Vineyard this past Sunday. If you have any prayer or ministry needs, please don't hesitate to contact us. We love doing God's work! 5. Send check to our home. Please contact us for our address. Today, I found myself hovering over Psalm 25:4-5. Show me the right path, O Lord; point out the road for me to follow. Lead me by your truth and teach me, for you are the God who saves me. All day long I put my hope in you. Do you often wonder if you are on the right path, the one God has for you? Have you ever asked for a sign from the Lord to show that you are? How many times do you find yourself waiting for the next step to take? I don't know about you, but waiting is hard. Waiting is what we've been doing for a very very long time. I don't mean to sound impatient, but we have been hearing it's time to launch, open doors in January, this is the year for divine order, etc. Last week, I asked the Lord for a sign, I said if we are on the right path, have someone give me $20. That night someone came to our home and the first thing they did was give me a $20 bill. They said the Lord told me to give this to you. (I should of asked for millions, hee hee). This is what we are doing now. Ken and I have both heard separately that we are to go back to Peru this summer with specific dates. Ken felt that this was a "scouting" trip. We sent an email off to Pastor Agapito, the man who we were connected to in our last visit. We just told him what we were hearing and asked what he thought about that? His response was very inviting. They welcome us with open arms. Praise God for that! We sent an email off to my niece who lives there and her response was that they would be out of the country the entire time we will be there. Ok God, what is the plan? (Silence...). I know some of you are probably laughing because you know God doesn't always reveal His plans until the last minute. I get that. I would just like a few details.....ha ha ha ha ha! Ok.. so here is what we are praying about and ask that if you feel led, to join us in prayer. We are anxious and excited to see how God shows up! He always does! 1. We would need a house/dog sitter. One who loves dogs and will allow two of them to sleep with them. One who can handle the home maintenance such as mowing the 2 acre yard and weed eating as well as anything else that might come up. 2. We need to supernaturally learn Spanish! We have 2 different Spanish courses - Rosetta Stone and Pimsleur. These are both very helpful and we are thankful that we have them. Unless God intervenes, there is no way we can be fluent in just a few months. 3. We need a place to stay in Peru. We are searching the internet for furnished apartments and have found a couple that are affordable and seem to be in a good area but we don't feel led to put a deposit down???? We need direction from the Lord. 4. Transportation while we are there - we can take taxis - but not knowing the city or the language could be challenging. 5. As we feel this is partially a scouting trip, it would be nice to have someone who can speak english to show us around Peru?? 6. I really would like to see my health restored. 7. Provision - for here and Peru! Last week I posted an article Joni Ames wrote on Patience and Kairos Timing. This one sentence is what it's all about. Timing is everything. Kairos moments of opportunity can be missed if we do not operate in the spirit of patience. We are waiting on God's perfect timing. We don't want to do or even attempt to do anything in our strength. We know when God is in it, He provides the grace and provision for it all! If the Lord should speak to you about our upcoming trip or ministry, please let us know. We welcome your prayers and feedback. Testimony: Last night we visited with some friends we hadn't seen in a while. Not only did we have a nice dinner and great fellowship, the Lord did some healing. As the night was dwindling down, I asked how we could pray for each of them and vice versa. The husband asked for prayer for his back as he had hurt it just that day. We prayed over his back and within just a few minutes the Lord provided healing - complete healing, no pain! Praise God! Their daughter needed prayer for her stomach and we prayed for her stomach as well. The pain went away and she said that she felt hungry for the first time all day. God is good!! Next week we will be teaching and ministering at Raytown Vineyard Church on March 25th. If you're in the area, please feel free to join us. Also - reminder of some events coming up - Please email me if you are interested in attending! Bob Sorge will be here 4/4. Joni Ames will be here early May. And Ken & I will be ordained 5/5! Patience & Kairos Timing - borrowed from a friend! Some of you subscribe to Joni's newsletters but for those that don't, I really thought this was a pertinent message and one to share. Joni has granted me permission. I hope you enjoy it. Also some information at bottom on how to support our ministry as well as upcoming events. Blessing! There's nothing quite like experience to teach us things! Through some health issues I've experienced over the past couple of months, the Lord has been speaking to me of the importance of both patience and kairos timing in order to attain my healing. The capacity, quality, or fact of being patient, long-suffering, resignation, forbearance. It denotes the capacity to endure hardship, difficulty, or inconvenience without complaint. - Ouch! - Without complaint?! Patience emphasizes calmness, self-control, and the willingness or ability to tolerate delay. - Ouch #2! - Tolerate delay?! Edmund Blade once said, "Our patience will achieve more than our force." Long-suffering is long and patient endurance, as of through being wronged or through provocation. Resignation implies acceptance of or submission to something; trying, as out of despair or necessity. Forbearance denotes restraint, as in holding back from retaliating, demanding what is due, or voicing disapproval. Now, we need to understand that patience is not opposite of kairos timing. Rather, it is the road map to it! We must be willing to be patient to reach the point of proper timing, and wise enough to recognize and move forward in it once it arrives. Kairos is an ancient Greek word meaning the right, opportune, or supreme moment. The ancient Greeks had two words for time, chronos and kairos. Chronos refers to chronological or sequential time; kairos signifies a time in between, a moment of undetermined period of time in which something special happens. While chronos is quantitative, kairos has a qualitative nature. Kairos also means weather in both ancient and modern Greek. In plural it is καιροι -kairoi and it means "the times". A kairos moment is as if a cloud filled sky suddenly parts and lets the sun shine through for only a moment. As the clouds continue to move, that opening closes as quickly as it opened. It is vital to move forward in a kairos moment of time when the "open window" of opportunity is provided, and everything falls into place. In these present times, it is vital to get an understanding of this, as it could spare our finances, relationships, or even our very lives! The whole earth is in a time of transition. We need to learn how to transition from patience into our kairos moments. Some have serious promises they think they have been waiting on God to fulfil, but he is probably waiting on many of us. Sometimes it’s hard to transition from being in a “Come along side another person” kind of position into becoming leader. But we must not let the paralysis of analysis hold us back. Learning to be patient is important, as well as learning the proper timing to stop waiting and move into the kairos timing once it presents itself. There is nothing like a near death experience to cause us afterwards to press towards that which is truly important. Many times, what we go through provides the pressure necessary to push us forward towards our purpose, call, destiny, and goals. Tribulation produces perseverance. The dramas, traumas, and difficulties we experience in life can be the very thing we need that will cause us to get up and fight for what we are called to do. Kind of like the saying, "Whatever doesn't kill us makes us stronger!" Romans 4:18 says, "Abraham, contrary to hope, in hope believed, so that he became the father of many nations, according to what was spoken, "So shall your descendants be." - CONTRARY to hope, IN hope he believed! So many quit as they experience trials or the trial of waiting. They quit when they are on the very threshold of the blessing! They then have to start all over. Why? It could be stubbornness, lack of commitment, lack of humility, impatience, fear (unbelief), hanging out with and listening to the wrong people. Some are simply a slave to the past by remembering how they have been rejected before, and therefore refusing to “take any chances” that history would repeat itself, so they reject before they get rejected again. (12) Not that I have already attained, or am already perfected; but I press on, that I may lay hold of that for which Christ Jesus has also laid hold of me. (13) Brethren, I do not count myself to have apprehended; but one thing I do, forgetting those things which are behind and reaching forward to those things which are ahead, (14) I press toward the goal for the prize of the upward call of God in Christ Jesus. (15) Therefore let us, as many as are mature, have this mind; and if in anything you think otherwise, God will reveal even this to you. (16) Nevertheless, to the degree that we have already attained, let us walk by the same rule, let us be of the same mind. Through my recent trials, the Lord also told me, "Count it all joy!" - Oh yay! - Right! - "Joy to be going through THIS?" I thought. And He said, "Yes. Joy to have the opportunity to show me that you believe me, and not your circumstances or the enemy's lies." (4) But let patience have its perfect work, that you may be perfect and complete, lacking nothing. So every time I had a pain or thought of complaining, I started saying or singing something about having joy! "I've got the joy, joy, joy, joy down in my heart!!!" BEWARE OF WHO/WHAT YOU ARE SWIMMING WITH! When Crocodile Man Steve Irwin got pierced in his heart and killed by that Stingray fish a few years ago, I felt there was a prophetic lesson to be learned. I asked the Lord about it and He said, "Tell my people to watch out who they swim with. Toxic people talk sick, and they will pierce you in the heart of relationships, and even your purpose, call, and destiny, and kill it and you." Many times, the poisonous talk of supposed "friends" can separate people from a spouse, other family members, friends, church or workplace relationships, and that which we are called to achieve - all through their negative talk. We need to recognize and set healthy boundaries so that we are not poisoned by their toxic talk. I saw a sign recently that read, "A dark room is where negatives develop" Don't let anyone trap you in their dark room by their toxic comments. Hebrews 3:15 says "Today, if you will hear His voice, Do not harden your hearts as in the rebellion." Giants in the land are a sign we are in the right place. The Lord showed me one day that the giants are at the gates of our promised land to scare off those it wasn't promised to, and to keep it secure for us. We need to not be pressured by fear or get lazy, but simply walk on in! They key is to hang out long enough after the patient endurance so that we actually RECEIVE the promise! Even the world knows it is important to write down and pursue our goals. Donald Trump was being interviewed and was asked if it was important to write down our goals. He emphatically said, "Yes." When asked why, he replied, "Those who write down their goals will achieve them. Those who do not will not." Tyler Perry (Of Madea plays and movie fame): was on a recent talk show and was asked who had been a major influence in his life to cause him achieve success. He told the story of how he was applying for a job and the man interviewing him looked over his resume and said, "You never finish anything do you?" Tyler Perry didn't get the job, but that comment changed his life. He became determined to begin sticking to his commitments, and to be careful to not make ones he wouldn't see through. Today he is one of the most successful men in the entertainment business. Don't acquiesce the gifts of awesome people God places in your life. Often we entangle ourselves in unnecessary arguments that cause relationships to collapse and bridges to be burned that we may need to travel on again. Some even miss out on the right mate because they refuse to be patient enough to see and acknowledge the gift that comes packaged in the form of a person God brings into their life. Patience produces character. Sometimes what we do NOT say is as important as what we do say. If we learn how to keep our mouth shut and keep our opinions to ourself, it could help keep our job, reputation, marriage, friendships, position in our church or community, and even our finances. It may even keep us from getting a nasty traffic ticket! A friend of mine likes to speed. Every time they get stopped, they get mad if they are not able to get out of the ticket and start making comments about the officer making his "quota." That never helps. It usually helps him find another charge to add to it. Soft answers turn away wrath, but grievous words stir up anger. (Prov. 15:1) We need to have the patience to keep our mouth shut when it is appropriate to do so. Patience produces hope. David encouraged himself in the Lord. (1 Samuel 30:6b) We can too. We can learn to self talk and encourage ourselves into things instead of out of them. Patience and contentment can cause us to appreciate people, situations, and the life we live, and save us from anxiety, depression, and even health issues that could come upon us as a result of negativity. There are times when people are so impatient with the Lord that they even take the law into their own hands, and end up in serious trouble. Even in prison. Patience will even keep us from walking in anger. I saw a sign that read, "Anger is only one letter away from Danger." Patience will keep us out of a lot of trouble that we don't have to get into. Many people church hop because they don't have the patience to see things through to completion. Therefore they lose their credibility and have to start all over again in a brand-new church. Why? Because pastors need to know those who labor among them. But then again they get impatient. They leave just before the blessing of trust and favor at that church too. Then they have to start that proving thing all over again. Lack of patience causes us to miss out on a lot. Lack of patience causes us to lose out on time. Time is life. Lack of patience causes us to waste parts of our life. And life is too precious for that. Having good communications skills includes being a good listener. A lot of healing can come as a result of being a good listener and being patient enough to really hear others' perspectives as well as God's. Sometimes we miss out on knowing a person for who they really are because we do not take the time to really listen. We jump to conclusions with our own opinions about what they mean and huge arguments result. We blame it on the spirit of Leviathan when it's really a spirit of impatience on our own part. What does all of this have to do with the prophetic? Everything! There are kairos moments in time when we need to speak up and give a word of the Lord to someone. There are other times when we just need to shut up and pray. If we are patient enough to hear what the Lord has to say about a situation, we will say things in the right timing and the right way, and it will be received. If we just blurt, disaster can result. We need to listen for the heart of God. Not just blurt out of opinion. It's God's kindness that leads us to repentance. (Romans 2:4-6) There is healing inside of kindness. Patience, patience, patience. In our patience we possess our souls. In our patience we possess our health and even our wealth. In our patience we possess right relationships. In our patience,we possess the outcome of our destiny. When you have a call on your life, God often hides you for a season now and then, for your own protection. You may not have anyone call you out to give you a prophetic word, while everyone else gets one. You may suffer miss-understandings, misinterpretation, miscommunication. Your motives and heart may be misread. You may have lies told about you. You may experience false accusations. Welcome to the club! It's all a part of the territory! The same things happened to Jesus, and He was/is perfect! What does the Word have to say about this? Inside it all, we get purged of people pleasing! 1. Renew the mind by reading the Word of God on a regular basis. 2. Bring thoughts into obedience to Christ. When I find my mind twirling around with all kinds of negative thoughts, I lay my hands on both sides of my head and use the above scripture and say, "Mind and thoughts, I command you in the name of Jesus to come into captivity to the obedience of Christ!" - "Stop thinking negative thoughts!" - And then I begin to wash myself with the water of the Word and scriptures such as, "I can do all things through Christ who strengthens me!" "God has GOOD plans for me!" etc. 4. Do your homework! Study up and learn all you can about what you believe you are called to. If it requires practice (like learning a musical instrument) then practice all you can! 5. Listen! You can't learn if you keep talking. It amazes me when I see people who say they would love to sit at Bob Jones' feet and learn from him, yet when they get the opportunity, they talk incessantly instead of listening! 7. Just do it! - Go ahead and walk into your promised land! Whatever that "it" is - JUST DO IT!!! 8. Don’t stop! - Don't let anything start stopping you, for it will never stop stopping you! as well as sending them to your own email lists and posting them on your own web sites. We ask only that you keep Joni's web site, email contact info, and author contact information intact. Donate to The InSightful Blessings - Phil 4:19 Fund! Joni Ames will be here end early May. And Ken & I will be ordained 5/5! Whoohoo!!! Monumental Movie - Information on how to change America's future! And 6 Healing Testimonies! Last week, I posted about what we believe the Lord has been speaking to many about the future of America. If you want to see change, if you want to make a difference in this country, here's an opportunity on how you can do so. Please check out the movie and preview information provided. The Monumental Movie will ONLY be in theaters one day. You can type in your zip code and it will show you where in your area you can see it. You must buy tickets online! Hope to see you there! I also wanted to share a quick story about God's divine healing. This past weekend we went to dinner with some friends and then back to their home to visit for a while. Their daughter "K" asked if we could pray for her because she had injured her knee and felt that she had torn her meniscus. Ouch! So, I asked if we could lay hands on her and I began to pray for God to come and bring healing. She felt the heat from my hands and knew that God was touching her knee. Her sister "L" came over to join in and instantly got a cramp in her leg, that stems from a back injury. When she held my hand, instantly the cramp went away and she sensed something going on in her back (because by that time her mom had joined us and was laying hands on "L's" back and she felt the heat from her mom's hands). Way cool. Dad started singing worship songs and strumming the guitar when all this began. We could totally feel the Holy Spirit's presence. After I got done praying for "K's" knee, I sensed the Lord wanted me to annoint her hands for healing. I grabbed both of her hands and held them and she could feel the heat and the electricity coming out of my hands. When all this was done, K's knee was completely healed!! "L's leg cramp and back was completely healed! We prayed for mom's ankle and she sensed a noticeable difference. She could actually move and twist her ankle around, something she couldn't do previously! Praise GOD!!!!! At this time, I sensed the Lord wanted me to give a quick informal teaching about how to recognize a healing environment so they would know when to pray for someone. (Not that we can't pray for someone anytime, but this was meant to be more a teaching about being Spirit led to pray). So after I taught, "S" son of "L", sensed someone had wrist pain. "L" sensed someone had left knee pain. Dad felt we were to pray for something in someone's head, maybe something clogged or blocked. Ken, my husband, heard left ear pain. Dad had the wrist pain and he was healed, "S" had the left ear pain and his eared popped after prayer and it was healed, me and the mom had knee pain, and I had the sinus blockage as well. The knee pain I had and have had since 1992 was healed. I had range of motion that I haven't had in 20 years. I was able to get up off the couch and walk without limping. My sinus are much improved and I am believing for a completed work! The mom just texted me back and told me that her knee is NOT sore and that is so good! So there was 6 of 7 of us that had a need for healing and we all got it! Isn't God good. All the time! We have seen divine healing and in some amazing ways but it still completely blows our mind when God shows up and does this. When we welcome the Holy Spirit and invite Him to have His way, He is more than gracious to accomodate us! Thank YOU JESUS!! Next week (I think) I will write an update about Peru! God is still speaking! Of course, He is!